SAN FRANCISCO (AP) — Microsoft is so confident it has the Internet's best email service that it is about to spend at least $30 million to send its message across the U.S. The barrage began Tuesday when Microsoft's twist on email, Outlook.com, escalated an assault on rival services from Google Inc., Yahoo Inc., AOL Inc. and a long list of Internet service providers. As part of the process, all users of Microsoft's Hotmail and other email services operating under different domains such as MSN.com will be automatically converted to Outlook.com by the summer, if they don't voluntarily switch before then. All the old messages, contacts and settings in the old inboxes will be exported to Outlook.com. Users will also be able to keep their old addresses. People still regularly check their inboxes, albeit increasingly on their smartphones. The recurring email habit provides Internet companies a way to keep people coming back to websites. It gives people a reason to log in during their visits so it's easier for email providers to track their activities. Frequent visits and personal identification are two of the keys to selling ads, the main way most websites make money. That's why Microsoft, Google and Yahoo have been retooling their email services in recent months. After keeping Outlook.com in a "preview" phase since July 31, Microsoft Corp. is ready to accept all comers. To welcome new users, Microsoft is financing what it believes to be the biggest marketing blitz in the history of email. Outlook.com will be featured in ads running on prime-time TV, radio stations, websites, billboards and buses. Microsoft expects to spend somewhere between $30 million to $90 million on the Outlook campaign, which will run for at least three months. The Outlook ads will overlap with an anti-Gmail marketing campaign that Microsoft launched earlier this month. The "Scroogled" attacks depict Gmail as a snoopy service that scans the contents of messages to deliver ads related to topics being discussed. The Gmail ads are meant to be educational while the Outlook campaign is motivational, said Dharmesh Mehta, Outlook.com's senior director. "We are trying to push people who have gotten lazy and comfortable with an email service that may not be all that great and help show them what email can really do for them," Mehta said. By Microsoft's own admission, Hotmail had lost the competitive edge that once made it the world's largest email service. The lack of innovation left an opening for Google to exploit when it unveiled Gmail nearly nine years ago. Google says Gmail has more than 425 million accountholders, including those that visit only on smartphones and other mobile devices. The latest data from research firm comScore, which doesn't include mobile traffic, shows Gmail with 306 million worldwide users through December, up 21 percent from the previous year. Yahoo's email ranked second with 293 million users, a 2 percent decrease from the previous year, followed by Hotmail at 267 million users, a 16 percent decline. None of these features are revolutionary. Google already has been giving its users the option to switch to a new version of Gmail that also allows for larger files to be sent in a single email. And address books in Gmail already fetch new contact information posted on Google Plus, although it doesn't yet mine Facebook, Twitter and LinkedIn. Outlook.com is the latest in a series of major product leases from Microsoft, which has been struggling to regain the cachet that once made it the world's most valuable technology company. Now, both Apple Inc. and Google are worth more because they have been growing far faster than Microsoft as their products win more fans. Apple's biggest gains have come from the iPhone and IPad, while Google has been benefiting from its dominance in Internet search and its widely used Android software for mobile devices. Investors evidently aren't convinced there will be a big payoff. 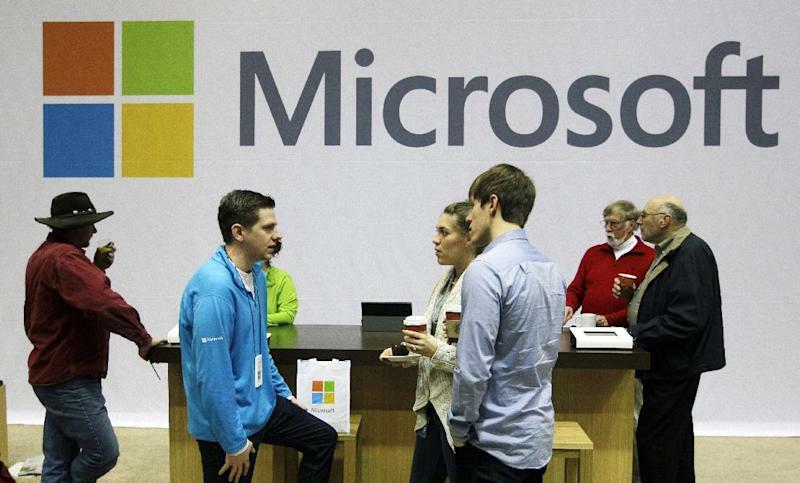 Microsoft's stock increased 26 cents Tuesday to close at $28.05. That's just 20 cents above the stock's price in late October when Microsoft released Windows 8. Google's stock has surged by 19 percent during the same stretch.